This weekend marks the highly anticipated opening of the new Lifestyle Club at William Lyon Homes’ award-winning Ovation community. Saturday, November 3 from 10AM-3PM visitors will be able to enjoy food, drinks, and giveaways to mark the occasion – along with ongoing tours to introduce the many features of this state-of-the-art facility. The Ovation Lifestyle Club consists of two complementary features: a nearly 17,000 square foot indoor clubhouse, placed amidst the surrounding golf-course frontage acreage with a multitude of outdoor active and recreational elements. Both areas include social spaces and designated activity areas for residents’ use, and together confirm this community’s reputation as an unrivaled 55+ home destination. The Club is an inviting architectural environment of clean lines and open volume. The finished result presents light-filled spaces of timeless design and signature elements which are among the hallmarks of the William Lyon Homes legacy. The Club’s location on the 9th hole of the golf course is one of the key features of its thoughtful orientation to nature, views, and outdoor living. Within the gates at Ovation is the private Lifestyle Club with multiple enjoyments both inside and out. Outdoors: tennis and pickleball, pool and spa, bocce courts, horseshoe pits, event lawn, shade pavilions, picnic and BBQ areas. Indoors: cardio and movement studio, game and billiards rooms, creativity center, multi-purpose space and demo kitchen, and great room and lounge for socializing. Outside the Ovation gates, and still within the Mountain Falls master-planned community, residents enjoy activities at the 18-hole golf course, Residents Facility with multiple active spaces both inside and out, dining, parks, and miles of trails. The Lifestyle Club itself is age-restricted and available for use only by Ovation residents. But the ability for Ovation residents to utilize both the Lifestyle Club and the Mountain Falls master-plan Residents Facility adds layers of both exclusivity and inclusion that is not typically available in a 55+ community. “Most importantly, we know the Club itself is only as dynamic as what occurs there,” adds Chitwood. “That’s why we have a full-time Lifestyle Director on site: to plan, think outside the box, and listen to the residents about how to make the most of the facility and the acres that surround it. It’s important to us to create an engaged community that allows everyone to take part in enjoyment of the Club. Residents at Ovation enjoy choices in their home environment, too. 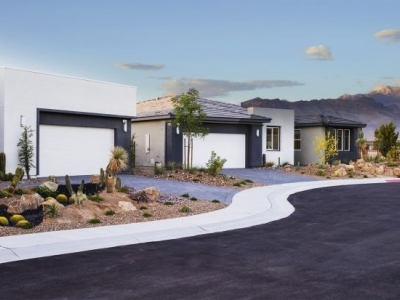 The homes available at Ovation’s gated, golf course community are in three series of designs: Onyx, Jade, and Topaz. 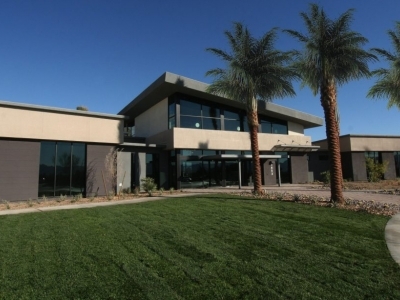 Each series features three single-story floorplans, with many of the homesites accompanied by golf course, desert, or mountain views. Homes are designed to offer private living spaces, smart technology, and a fresh, contemporary style that is creatively rich in natural light. Of particular note is the open concept interior of main gathering areas that effortlessly weave indoor and outdoor spaces into a seamless environment. Onyx leads the trio of communities with homes from two to three bedrooms and two to 2.5 baths, and each design includes a welcoming foyer that leads to a spacious Great Room and Kitchen area. Homes range in size from 1,462 to 1,721 square feet, with pricing from $216,700. Jade steps up in both size and flexibility with homes from 1,982 to 2,152 square feet and pricing from $268,500. Two to four bedrooms are available with up to 2.5 baths, and include a number of optional room configurations per plan. Topaz is the largest of the collection and is priced from $318,800 for homes ranging from 2,337 to 2,494 square feet. Buyers can choose from two to four bedrooms, and 2.5 baths, and up to three-car garage (per plan), with a number of area configurations available. Those familiar with William Lyon Homes will recognize the painstaking attention to every detail in the selection of finish materials chosen and quality of construction. At Ovation at Mountain Falls, these include granite or quartz kitchen countertops, designer plumbing fixtures, quality cabinetry and much more. Buyers can also visit the William Lyon Design Studio to enjoy this award-winning builder’s full Design Center experience. To visit Ovation, take Blue Diamond Road/Nevada State Road 160 west about 45 minutes from Interstate 15. Before reaching the town of Pahrump, turn left onto Mountain Falls Blvd. As the road ends at the golf course, turn right onto Mountain Falls Parkway, then travel approximately 1.5 miles to Ovation Blvd. Turn left at the main gated entrance. For more information call 702-766-1860, or visit www.OvationMountainFalls.com.